It is generally incontrovertible that a doubling of carbon dioxide (CO2) imparts 3.7 +/- 0.4 W/m2 of radiative forcing at the tropopause, and some hypothesize that this energy imbalance can only be remedied via an increase in tropospheric temperatures. Radiative forcing is the difference between incoming solar radiation, and outgoing energy reradiated back into space. Carbon dioxide creates a positive radiative forcing – that is – an energy imbalance, since more energy is absorbed by the Earth than is radiated back into space. The inquiry to pose is not whether carbon dioxide imparts additional radiative forcing, but what precisely is the Earth system response, particularly regarding Earth’s sensitivity to Co2. Those who subscribe to significant warming scenarios typically foresee realized estimated climate sensitivity values of at least 2.5 degrees C to upwards of 4 degrees C. Estimated climate sensitivity (ECS) is a quantitative measure of Earth’s temperature change in response to a doubling of CO2. However, there is significant discordance in the scientific literature concerning the ECS of Earth, ranging from under 1.0 degrees Celsius (C), to 1.0 C-3.0C, and still other studies indicate greater than 3.0C. The time frame under consideration with ECS values in generally about 1,000 years. In a laboratory setting, CO2 radiative forcing is hypothesized to induce a tropospheric temperature increase of approximately 1.0C. This is somewhat irrelevant though, in light of the fact that Earth’s feedback systems will alter (possibly significantly) the resultant value. Both the magnitude and direction of the feedbacks are in dispute, with the lower (higher) ECS values asserting net negative (positive) feedbacks. One integral feedback process is the development of low level cloudiness as global temperatures warm, due to the fact that these clouds are predominately surface cooling rather than heat trapping (e.g., higher level clouds). The solar component to climate change is often unnecessarily constrained by mere examination of total solar irradiance (TSI), which is a quantitative measure of solar radiative power on Earth’s atmosphere. There are solar amplification mechanisms beyond TSI, including, but not limited to: variations in ultra-violet (UV) radiation and corresponding modulation of atmospheric ozone chemistry, thus, indirectly affecting climate; changes in radiative forcing due to less (more) clouds via decreases (increases) in cosmic rays; cosmic ray impact on the lower stratospheric ozone budget, the influence of ozone on the temperature/humidity trends near the tropopause and consequently the greenhouse effect; variations in geomagnetic activity, particularly concerning their impact at higher latitudes, and finally, the cumulative forcing induced by successive solar cycles of high magnitude on the climate regime. Accumulated solar energy has a much higher correlation to global temperature than singular sunspot cycles. Due to the Earth’s thermal inertia (resistance to change) via the slower equilibration mediated by the oceans, it takes longer for the full effects of heightened solar forcing to manifest in terms of surface temperatures. Consider the following example. You are boiling a pot of water on the stove. In this analogy, the stove burners are the Sun’s solar energy, and the water in the pot is Earth’s temperature. If one turns the burner higher, the temperature in the pot of water will increase. If the burner is turned down to slightly lower level, will this result in a cooling of the water? It depends upon the extent to which one turns the burner down. The water in the pot will continue warming, even if the burner is turned lower, if the incoming energy exceeds the outgoing energy. Once the burner is turned sufficiently low, equilibration will be reached (incoming equals outgoing energy). Beyond this point, outgoing energy exceeds incoming energy from the burner, and the water in the pot will begin to cool. This is very similar to the process that occurs via solar energy and oceanic thermal inertia. And thus, multiple similar strong solar cycles, while not increasing in magnitude, will certainly aid in enhancing the warming over time. And this warming will continue (though at a slower rate) with decreased solar activity – initially – until that threshold of equilibration is reached. The modern maximum of solar activity is unique in the record over the past 400 years, considering the mid-late 1900s featured several potent solar cycles. Further, only about 20% of the oceans receive solar insolation; thus, conduction and fluid motion are responsible for the equilibration process which is extremely protracted. Linear statistical relationships between solar forcing and global temperature are therefore usually weak, if one does not consider the lagged response of global temperature via oceanic thermal inertia. It is unsurprising to me that global temperatures surged in late 1990s, approximately 30-40 years subsequent to peak solar forcing in the 1960s. Accumulated solar energy and concomitant oceanic thermal inertia necessitates a lagged sfc T response. The following are studies corroborating the aforementioned assertions. 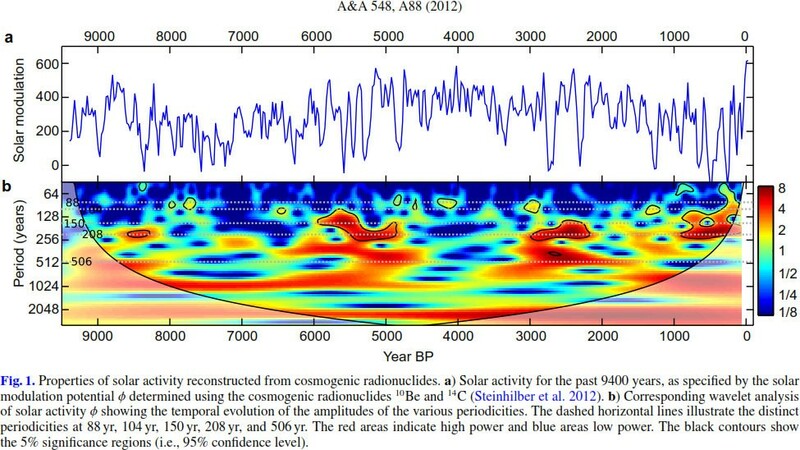 The following paper demonstrates that solar activity in the most recent period was at its highest levels in 9,400 years. If one merely juxtaposes the global temperature anomaly record of the late 1800s and early 1900s, one can see the effect of thermal inertia to which I refer herein. The onset of cooling initiated 7-10 years following very low solar forcing with the minimum in global temperatures achieved at least 25 years subsequent to the initiation of suppressed solar forcing. To disambiguate: in totality, my argument – simplified and elucidated – is as follows: anthropogenic climate change exists and Co2 radiative forcing is legitimate; however, the solar forcing component is significantly underestimated given there is a myopic proclivity to concentrate on TSI variations, while concurrently failing to recognize the other, integral modulatory mechanisms of the Sun. Further, the effects of thermal inertia are largely ignored, which plays an exceptionally influential role in determining the atmospheric response time. The extent to which the Earth will warm as a function of increased CO2 is still debated in the literature. In order to determine the percentage of warming ascribed to both solar activity and anthropogenic activity, we will need more empirical data, which means many more years of observation. However, it would be prudent to take necessary measures to reduce greenhouse gas emissions (GHG) as a prophylactic mechanism, and continue to transition into a mode of renewable energy usage (hydro, solar, wind, tidal, nuclear, etc. ), as dictated by the precautionary principle.